Cafe Sushi Troy review, hours, and menu info. Cafe Sushi Troy is located in a strip mall on Maple Rd. between Crooks and Livernois in Troy Michigan. 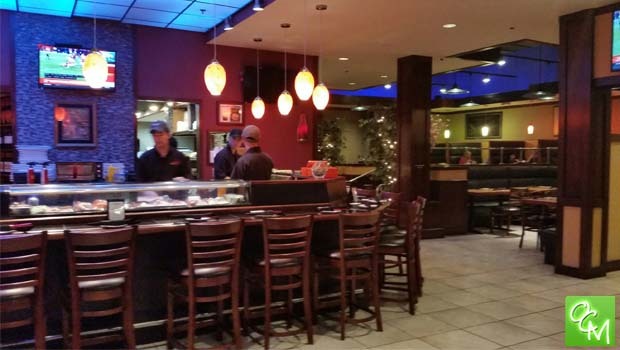 Cafe Sushi offers a full Asian, Chinese and Japanese menu. Cafe Sushi seems relatively modern inside so it’s a great dining in option. I love visiting different sushi restaurants and experiencing all the unique creations. Sushi restaurants take pride in coming up with all the creative rolls, and it truly is what makes dining for sushi so fun and enjoyable. Cafe Sushi does not disappoint in the creativity department. I will have to come back to Cafe Sushi multiple times in order to try every roll on this menu that sounds interesting to me. For my first visit to Cafe Sushi, I played it safe as I did not have a menu and the online menu on my cell phone was difficult to sort through. So, I ordered the shrimp California roll, the Nancy roll and the Michigan roll. The Nancy roll was new for me – I could not resist it because I love garlic and green onions and this one has roasted garlic and grilled green onion with asparagus. I would never have thought of grilling the green onion! And, roasting the garlic gives it so much more flavor. I loved the rolls, but can’t wait to go back and try more at Cafe Sushi! Aside from the classic rolls (AAC, California, Spicy tuna, etc.) you’ll find creations such as the Max Roll – Cover a California Roll with Spicy Mayo baked into Shrimp and Onion; the Asahi – Spicy Tuna and Roasted Garlic wrapped in soy, Broiled Ebi and spicy mayo burned in; and the Surf n’ Turf – Shrimp Tempura, Beef, Crabstick, Avocado, Asparagus, and Spicy Mayo/Eel Dressing. Cafe Sushi is very artistic with their sushi making. The rest of the Cafe Sushi menu sounds irresistible as well. Noodles and rice dishes such as udon dishes, fried rice and singapore noodles…; beef entrees like Mongolian beef, Hunan beef, beef teriyaki…; chicken dishes such as General Zao’s, ginger chicken and more; vegetarian entrees; bento boxes; and seafood entrees that I can’t wait to try! Scarlet Lobster (stir fried lobster with garlic, onions, scallions and ginger), Pearly scallops (stir fried scallops with onions, ginger, peapods, scallions and broccoli, honey glazed shrimp, and salmon teriyaki are just a few of the seafood entrees offered. Cafe Sushi offers happy hour every Monday through Friday from 3p-6p.